Definition at line 88 of file BTFDebug.h. Definition at line 131 of file BTFDebug.cpp. References llvm::BTFTypeBase::BTFType, llvm::DIType::getSizeInBits(), llvm::BTF::CommonType::Info, llvm::BTFTypeBase::Kind, llvm::BTFTypeBase::roundupToBytes(), and llvm::BTF::CommonType::Size. Complete BTF type generation after all related DebugInfo types have been visited so their BTF type id's are available for cross referece. Definition at line 137 of file BTFDebug.cpp. 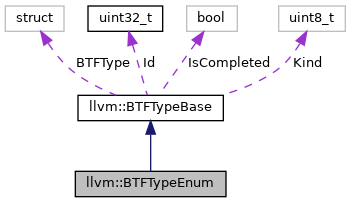 References llvm::BTFDebug::addString(), llvm::BTFTypeBase::BTFType, llvm::DICompositeType::getElements(), llvm::DIType::getName(), llvm::BTF::CommonType::NameOff, llvm::BTF::BTFEnum::NameOff, and llvm::BTF::BTFEnum::Val. Definition at line 152 of file BTFDebug.cpp. Definition at line 94 of file BTFDebug.h. References llvm::BTF::BTFEnumSize, llvm::BTFTypeBase::completeType(), llvm::BTFTypeBase::emitType(), and llvm::BTFTypeBase::getSize().